by Bill Dwight on Wednesday, September 26, 2012 at 9:51 AM | LEAVE A COMMENT! Who doesn’t want to print their own money? Lots of parents like to use point systems instead of money to reward younger kids for certain tasks or achievements. Those points can typically be redeemed for some fun activity with Mom or Dad — like an outing to the movies — or extra computer or gaming time. If you like that approach, you might like this fun site I stumbled upon while reading the comments in an article about chores. 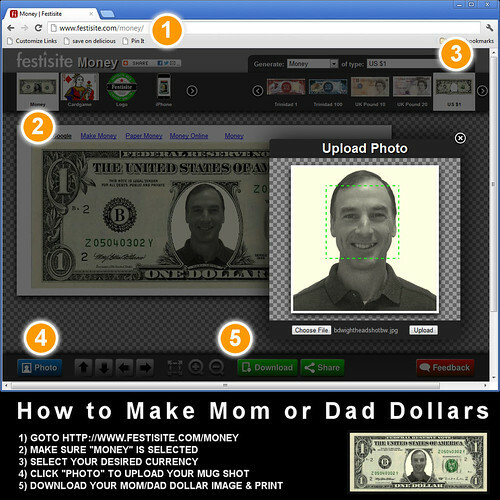 It helps you create fake money with your picture on it — instant Mom/Dad dollars! Hand out Mom/Dad dollars for completed tasks or achievements or just as a random act of parental kindness. You might want to create a rewards chart with your kids indicating how they can be redeemed. Make sure “Money” is selected in the upper left. Select your desired currency in the upper right. Click the “Photo” button in the lower left to upload your favorite mug shot. Click the “Download” button in the lower left to download an image of your custom money that you can then print from your computer. Tween Tip: if your kid is getting to the far edge of that precious Mom-And-Dad-Are-Still-Cool stage, try Justin Bieber’s photo instead of your own.